The meditation classes we offer are suitable for all individuals whatever their level of interest, from those who seek simple relaxation and stress relief, to those who wish to learn about Modern Buddhism. Everyone is welcome regardless of belief; you do not need to be a Buddhist to attend. A typical class consists of a simple relaxation meditation, teaching, discussion and final meditation. The meditations are guided and are suitable for beginners and experienced practitioners alike. Each class is self-contained so feel free to start at any time. Everyone is welcome; just drop in! Most classes last an hour to an hour and a half. To ensure that everyone is comfortable you may sit in a chair, or on a cushion; these are available at the Center. There is no physical exercise, yoga, or stretching involved. After the class everyone is welcome to stay for socializing and refreshments. Our general program classes are designed for you to drop-in to any class. While they are arranged around a topic, each class is self-contained. You can attend the whole course or simply drop in whenever you can. You do not need to book in advance, just choose a meditation class near you and pay when you arrive. If you would like more information or help, please contact us. Q: I’m new and curious about meditation. Which class should I go to first? General Program classes are a wonderful opportunity to learn about Buddhist teachings, meditation and practice. 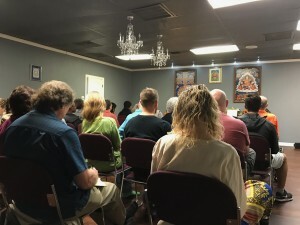 The range of topics includes Buddhist view, understanding the mind, improving relationships, letting go of anger, understanding karma, and more. General program classes meet Tuesday evenings. 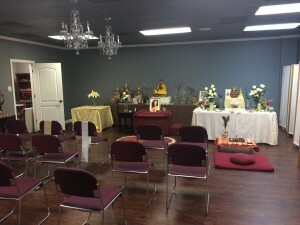 We also have a 30 minute meditation class that meets at HWY 108 4410, 50th St. in Lubbock. See the menu listing of classes on the left. On Sunday mornings, we offer Prayers for World Peace. This is a simple service that includes beautiful prayers, a brief teaching and a simple breathing meditation. There is no class fee for Prayers for World Peace, but donations are welcomed. Classes generally go on for an hour to an hour and a half. Look for more details on class pages. Q: I’ve never been to a Buddhist center before. What should I expect? 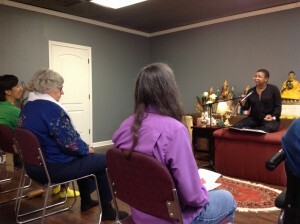 Classes at the center are very accessible. Teachings and prayers are all in English. You do not need to bring any mats or wear any special clothing. Comfortable chairs are used for seating. When entering the meditation room, it is traditional to take off shoes and hats. Also, when the Teacher enters, we normally stand out of respect for Buddha’s teachings. Q: I’ve been coming to classes for a while. I really like what I hear. Is there something more I can try? For those students who want to deepen their experience of Buddhism, Geshe Kelsang Gyatso designed the Foundation Program. The Foundation Program (FP) immerses us in Buddhist teachings by studying systematically one of five texts on the FP curriculum.